Don't panic when the first wiff arrives at your nostrils, the phenol is a bit breath taking. After a few minutes the picture chages completely, add some water to help it open up. A true sherry origin is very apparent. Expect typical grain aromas coupled with intense sherry sweetness. A dream of a dram. N: After my initial disappointment on opening, some days later the development of rich fungal complexities begun to replace the soft & somewhat flat yet candid oloroso. Then came fruits with a vegetal [buttered] broccoli note and some corn oil. T: Surprisingly more vibrant/less flat on opening out. Like on the nose, the more blatant oloroso notes fall away to reveal instead a sweet & oaky fungal soup with some Vegemite leading into an initially dry development. Later the arrival is on mocha caramel followed by a darker, dry sherry complex. The middle stages see a little baked pear, dark cherry liqueur and sweet bitters - the woodiness never overshadowing. A touch of cocoa butter milk into the finish, almost a waxiness. A drop of water [for the relative heat], provides an alternative & favourable chewing experience - almost gummy-like, with a touch of Muscovado. F: There’s some aniseed heat that I read as coming from both the wood spice and the high abv - very little for the angels here. A wisp of used match [the nearest to sulphur this one’s going to get], and the development of a dirty sooty/ashy/ mechanics oiliness wraps this one up. C: Delicious juice, easily drunk. Sweet and sour fruit sweets, Caribbean rum, old dusty books, freshly beaten wood (not resinous), and apple juice can be recognized. Despite the high alcohol content no unpleasant stinging in the nose. The sweetness that I love so much with old Grains is, unfortunately, very weak here. Although this grain looks full, round and ripe, but compared to the grains I have tried so far, it is not very complex. 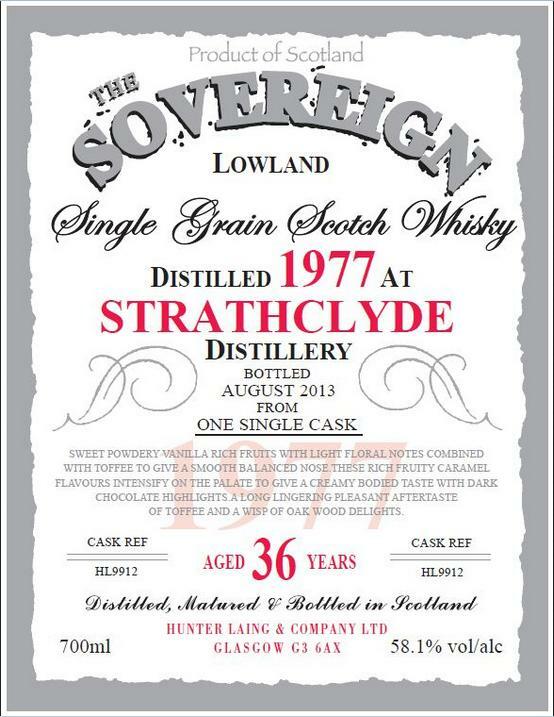 In view of the high alcohol content of this Strathclyde has a surprisingly mild onset. This grain takes its time and increases slowly and elegantly. Wonderful wood notes mate with mild spices. This is accompanied by a light, fruity sweetness. Medium length with light sweetness, some spice and mild wood. On the day of the Queens 'official' birthday, this is my 'Anniversary' offering. The three links being that this  ‘Sovereign' bottling was distilled  40 years ago on the  Queens Silver Jubilee year - not that im a royalist at all. N: Bearing in mind its just been opened it appears somewhat soft>>dull, although it did follow the young [uber-technicolor] SMWS [Dailuaine]. In hindsight maybe it would have better following the Lochside but whos to know? Anyway, back to the 'things'. At first theres plenty of heavy-handed oloroso to contend with, not at all how i remembered it before from a sample that had breathed. What i do like is the deep, mellowed-sugar richness. Its nice to get away from the [often predictable] varnished bubble-gum bourbon grains from time to time. T: Big, deep yet soft sherry - im dreaming of that young 'Dark Side' Tulli WB at 37 years old. F: Rather blatant oloroso dollop at first before the delicious wood comes through. Im enjoying the ‘single malt character’ finish, that association mainly coming down to the sherry cask and the fact that Strathclyde & sherry fit like a glove. On this day in 1909, the first genuine emergency SOS signal was transmitted. News of the sound barrier being broken is released to the public by the U.S. Air Force in 1948. Breaking not through but over the rainbow, Judy Garland was born on this day in 1922. The nose is awesome, well worth buying IMHO. Palate not bad either, the best grain I have had for a long time. That is a lovely nose, rum & raisin fudge and ice cream, dark orange marmalade,, furniture polish and old leather. Good medium length with a spicy sweet finish to the end. 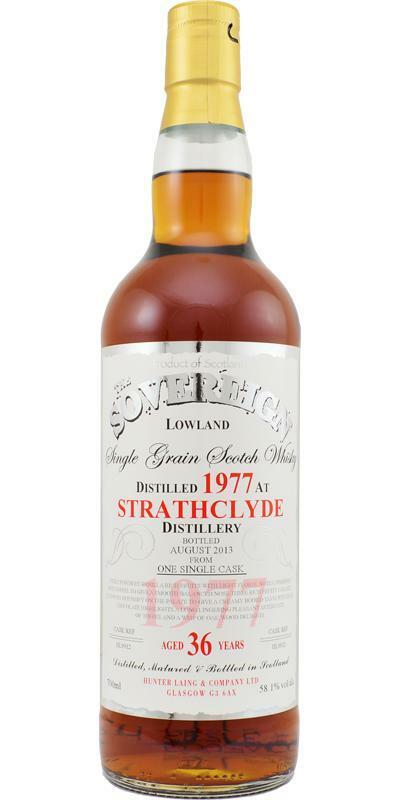 Even though from a well-informed source this Strathclyde is in bourbon cask, his 36 years spent in it give him family traits with Sherry casks. From the nose, we can also ask the question of whether we are not dealing with a Sherry cask. Disturbing. Maybe it's due to the fact that it's a grain whiskey? Out of these existential questions, he is very good and very greedy; a perfect Christmas whiskey. Powerful and even quite alcoholic at first contact, on cooked caramel, sweet spices in profusion, white and dry black grapes, hazelnut, candied orange, and many lacquered precious woods. It makes things happen at once! Much more accessible than the nose at first, despite its 58%. Candied orange liqueur, raisin. A caramelized heat swells in the cheeks. Hazelnut wood, brown sugar, and green tobacco. Long. Green wood, almost minty, almost "virgin oak" in some ways, is growing rapidly. A spicy explosion, soy sauce and black fruits. N: Initially, slightly burned and very tannic>estery with sweet prunes/fresh figs. A touch of soy sauce & tomato ketchup is mixed with sweet tamarind paste, sweet chilli & oyster sauce to provide the marinade for green pepper/tomato/mushroom/pineapple BBQ skewers served alongside nutty sweetcorn fritters. I like the nose but i have no idea which way this is going. T: Surprisingly weak arrival [only for a second] before the [oloroso] sherry bursts onto the scene. Theres a hint of sulphur but this disappears almost instantaneously. The mouthful builds, becoming enormous and grandiose and showing its abv strength throughout the development,…. and importantly it’s Incredibly alive and vibrant yet controlled and relaxed with an almost unfathomable offering of natural grape/pectin sweetness and oak coupled with a nutty, smoked oiliness that reminds one of Balcones Brimstone or Noah’s Mill bourbon. And breath. C: Fabulous [and worth every penny]. This is as good as any sherried whisky, grain or otherwise.